While the top secret project has demanded a fair amount of my time and minimal photography skills don’t assume I haven’t been busy. As part of my 101 I wanted to knit six different Cookie A patterns, so here is number two, as I did two pair of pomas recently. 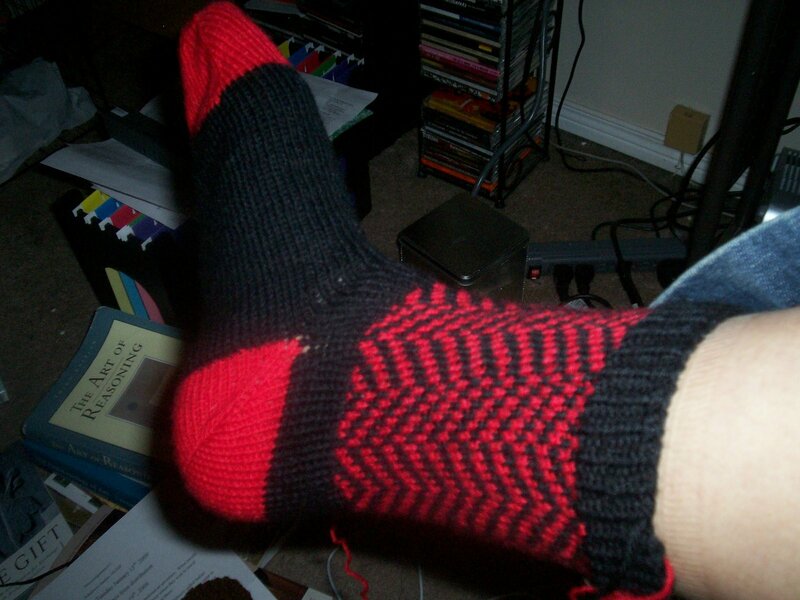 It’s the red Herring pattern, I’m calling these my socialist socks, or the communistas. The first one is done, I haven’t weaved the ends in yet but you get the picture (literally). I may do the second one in opposing colors just for a change. It could be fun. Either way I may need to buy more black as it is running much lower than the red. Also a factor in the opposing color for the second sock. This here is my new pen (a Lamy) and my Andre scarf thus far. I find all the colorwork very intense and really if it weren’t Andre I doubt I would have made it this far, but I want it, and that keeps me trudgeing along in a line. 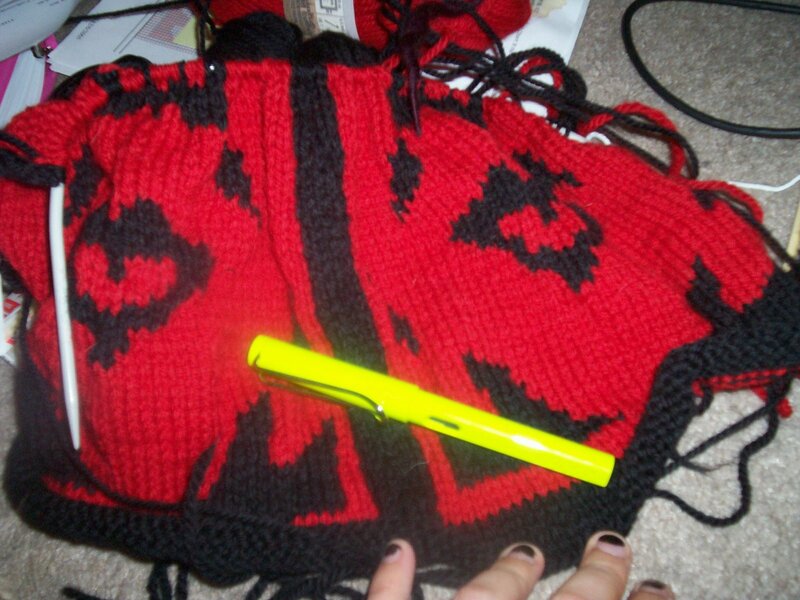 Once I get the the solid black circular knitting I’ll laugh but right now it hurts my brain. It seems like my color pallet has become blindsided by black and red but I’m also working on a brown cardigan and the blue top secret project. I also got a bag of stuff off to good will today, which made me feel better (better out than in my tiny apartment). Slowly I’m clawing my way out of the mess that is my life and apartment. slowly. Yesterday I found a storage cube on sale at Canadian Tire, so I bought it got it home and added it on to my pathetic cube (which due to many moves has been reduced to a mere two cubes). Then I started moving yarns over. This is about 90% of my stash at the moment. The acrylic remains in bags in my bedroom closet, the roving has been moved to the kitchen where I had previously stored the yarn, and a few odds and ends have yet to make their ways to the new cube of yarny greatness. The organization is semi-haphazardous. The top lrft is for sock yarns and sock weight yarns, under it is for handspun. It seems like a small amount of handspun but I try to knit from handspun as much as possible these days, aside from socks and certain patterns. The third cube on the left is basically empty, there’s some roving that hasn’t been moved yet and a few skiens of purple briggs and little sport that languishes for a pattern. It will languish longer. 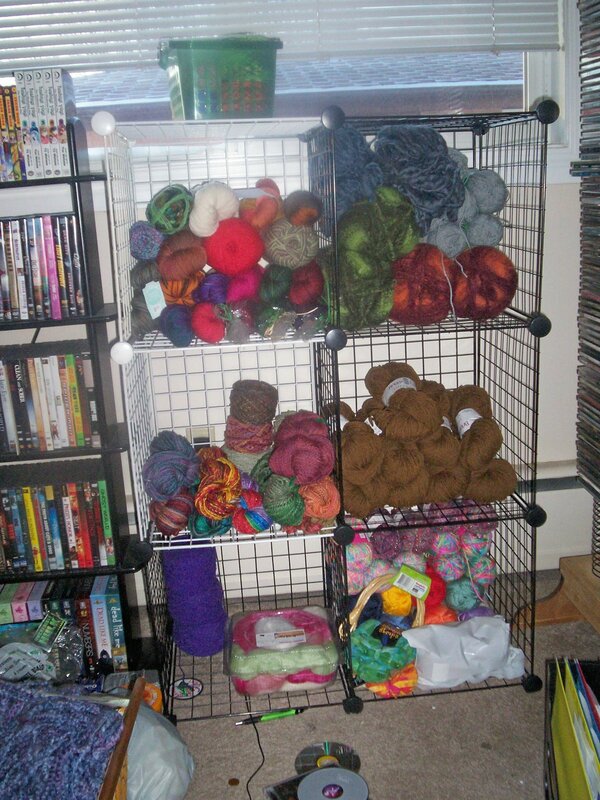 The top right cube has two afghans worth of bernat self striping, two skeins of ultra bulky from my sil at christmas and a six or so skiens of lady fair that I got at value village and haven’t knit anything out of. The right middle cube holds the B&L soft spun for the simple knit bodice which I have started but will probably take a lot longer than it should because of other knitting duties. And the bottom is where the acrylics for neices and nephews hide. as well as the possum blend I bought ages ago but can’t knit due to the sheer pain of being allergic to possum. Sad and true that’s why it’s in a bag. In other news I got all the christmas knits done, and I’m working on a top secret project that everyone will see soon enough. I have cast it on and am merrily going through it, the snail mitts of which are 75% done are on hold for the time being because of said project. I predict with school I’ll get it done in no time though. The snail mitts as previously mentioned are almost 75% done, I’m almost to the thumb on the second mit and they knit up quite quickly. I finished a cowl for mom that came out of left field but was asked for so I couldn’t resist the oppertunity to knit it for her. I swear I am this boring.